All week we have taken a look at the Caps that are unrestricted free agents. There are a few more of note, but it is likely that they will be resigned or will be dumped. We can take a quick look at all the minor notes for the Capitals that can change this team in the coming summer months. RFA: Karl Alzner - The Capitals would be stupid not to sign the rookie defenseman to an extension. 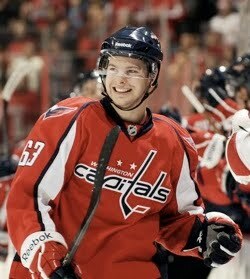 At this point it would be about finding the right number to keep him in a Capitals uniform. Since he is a restrictive free agent, the Caps do have the right to match any offer made to him by any other team. 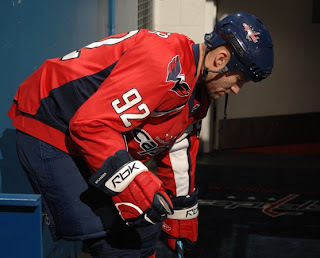 In 82 games played, Alzner racked up two goals and ten assists. But it is his defensive positioning that is impeccable and often he can read the play and defuse an offensive attack. He was a +12 on the season. RFA: Andrew Gordon - Averaging just over a point a game in Hershey, Gordon brings some reliability in scoring for the Bears on the farm team. But in 9 games with the big club he only had a goal and an assist. His size is a big negative on his game, but he makes up for it by being an opportunistic goal scorer. UFA: Dany Sabourin - Brought in as a possible back up at the big club level, he spent all his time down at Hershey and then just disappeared off the map as the Caps would rather call up Braden Holtby. Sabourin did not play a single regular season game for the Capitals and it is likely he will go to the open market come July. UFA: Micheal Nylander - Free at last, free at last. This marks the last year the Caps will play the forward since acquiring him in free agency in 2007. When the Caps made a change in coaching, Nylander was the odd man out and he spent most of the last couple of years playing for minor league teams and in Europe as well. He played last season with the Rochester Americans and only played 7 games and had 4 goals and 2 assists. I hope they sign Alzner before July 1, I'm sure he'd get an offer, and although he didn't win the Cup, he's better than Hjalmarsson in Chicago (who signed an offer sheet with San Jose, which Chicago promptly matched). I'd keep Andrew Gordon, I think he has a spot on the 3rd or 4th line, but I know a lot of Caps fans don't agree with me. Agree that the rest will walk. Nylander walking is a given. Since his last injury, he may be done anyway. Sabourin started as the backup for Hershey. Then hurt his knee and needed surgery during the Jan/Feb time frame. I presume the Caps will sign Alzner.